We are living through a terrifying global experiment, where we are contributing to climate change risks that have profound implications for both natural and human systems. Sea-level rise, ocean acidification, species extinctions, reduced food, water and livelihood security, more extreme weather events. The list of observed and potential climate change impacts is long, and likely to include many unfortunate surprises. It is not a well-planned experiment, nor has it been subject to the rigorous ethical reviews that are now standard for legitimate scientific experiments. If it were proposed as a deliberate experiment, there is no doubt that it would be deemed too risky, too costly, too unethical, and too foolish. Proposing a “greenhouse” experiment that could lead to severe, widespread and irreversible impacts globally would never be taken seriously by research funders. Yet it is an experiment that is underway, and we are starting to see the results every day, all over the world. Now it is time for a new and better experiment: An experiment about global social transformations. This is an experiment where humans take responsibility for creating a world with minimum climate change and maximum well-being for everyone. It is an experiment where each individual dares to make a difference in the world by contributing to rapid, positive impacts on a planetary scale. The idea is not new. In 1927, R. Buckminster Fuller made the decision to treat his life as an experiment to see what difference an individual could make in the world. He wanted to create a world that worked for everyone, and his accomplishments toward that goal were remarkable. Fuller’s research showed that it is possible to end poverty and the use of fossil and nuclear fuels, and his architectural designs and inventions included the geodesic dome, and practical, inexpensive housing and transportation. R. Buckminster Fuller is recognized as one of the greatest thinkers of all time, and is an inspiration to many because he dared to show what is possible. How do we generate social transformations in an ethical, equitable, and sustainable manner? Where do we begin? We will begin with an experiment called the Visit the cCHANGE Challenge website. This experiment starts with a straightforward hypothesis: Social change is a non-linear process that can be scaled up quickly and easily when enough individuals consciously engage with change. To test this hypothesis, we challenge every person to experiment with one small change for 30 days, reflecting on the impact that this change has on one’s own attitude towards change, on the attitudes of others, on individual and shared behaviors, and on systems. The reflection process is critical, for it can trigger important insights on the visible and invisible connections among people and groups, on the relationship between personal change and political change, on systems change, and not the least, on power. The experimental design for the cCHANGE Challenge is based on three principles: 1) An ethical principle whereby participants decide for themselves the types of changes that they are willing to make; 2) An equity principle whereby the experiment is open to every person, regardless of social or cultural background; and 3) A sustainability principle, whereby the changes have to, in some way, contribute to a world where everyone can thrive. The experiment has started in Norway, a Scandinavian country with a population of about five million. Twelve individuals have been invited to participate in the first 30-day cCHANGE Challenge, which is taking place from November 20th to December 19th, 2014. Examples of personal challenges include not eating meat, not using plastic bags, limiting personal spending, turning off the electricity for two hours a day (unplugged from the Internet! ), and taking an hour each morning to do something creative. They also involve reducing personal carbon budgets, driving less, not driving to work, taking a lunchbox to work, sorting trash, and using the stairs instead of the elevator. Reflections, frustrations, insights and photos will be posted on individual pages (in Norwegian) throughout the month, and some will be shared on Facebook and Twitter. 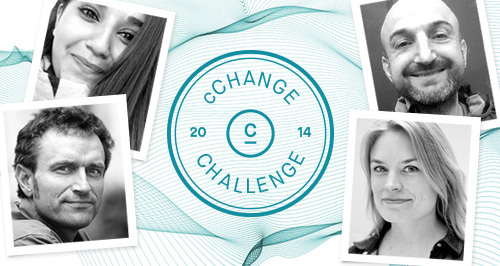 The cCHANGE Challenge will communicate and spread what conscious social change is all about. If we each follow in the footsteps of R. Buckminster Fuller and treat our life as a conscious experiment, we are likely to realize that we can indeed transform the world – but perhaps not in the ways that we expect. At the end of the month, each participant will reflect on whether, where and how their small changes made a difference. What was lost, and what was gained? To be clear, most participants probably realize that their experiments alone will not change the world. But what these small actions may do is change the way that they ‘see’ change. The experiments may lead to important insights on systems change, and they may influence conversations and interactions with family, friends and neighbors. They may even change the way that participants relate to politics. Most important, however, is that they may have a better understanding of power, expecially their own. This first cCHANGE Challenge is a pilot project supported by the Norwegian Environment Agency, whose primary tasks are to reduce greenhouse gas emissions, manage Norwegian nature and prevent pollution. In 2015 and beyond, we will work with individuals and organizations to expand the cCHANGE Challenge nationally and internationally , inviting teachers, artists, scientists, chefs, activists, youth, elders, doctors, electricians, journalists, skiers, diplomats, IPCC authors — eventually everyone — to participate in an experiment to change the world. The best way to experience the potential for non-linear social transformations towards a thrivable world is not by experimenting with life, but by treating life as an experiment. We hope that you will join us in this exciting global experiment!